Heroin consumption began among the socially and economically marginal, those most alienated from mainstream American life. The drug opened up an alternative way of organizing a life—dominated by the daily need to get money and score heroin. It also provided a means of identifying with particular subcultures, such as jazz musicians and neighborhood cool cats and hustlers in the 1940s and 1950s, counter culture drop outs in the 1960s, and punks and hipsters in later decades. These subcultures were both social and spatial entities and anchored heroin use in sets of institutions—bars, hangouts, vacant buildings—and specific neighborhoods. I am first and foremost a social ecologist. I tell my students that people make space, but space also makes people; this is why understanding the social and spatial settings of heroin use is so important. 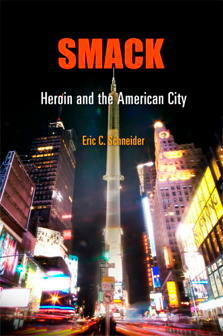 Everything about heroin from the acquisition of drug knowledge, to the rituals and practices of using, to the process of recovering is organized spatially and is encoded, frequently quite visibly, in the urban landscape. Other drugs have different etiologies and patterns of use, and I would be interested to see how a drug such as methamphetamine, for example—usually thought of as a rural, white drug—is located in the social and spatial life of rural America. Drug and alcohol historians might want to explore the historical social ecology of the substances they write about. Lee Robbins’ Vietnam Era Study convinced me of the importance of social setting. If Vietnam veterans were exposed to the most potent heroin available, even if only for the length of their tours of duty, and approximately ninety percent were able to desist from heroin use upon returning to the US, what does that say about the plasticity of human beings and the “brain disease” model of addiction? I also became convinced of the futility of a drug war aimed at containing supply and incarcerating users. Poppy production has shifted many times from one part of the globe to another as states have attempted to curtail it. There will always be marginal areas and weak states, where poppy cultivation will take root. So it seems to me that public policy has to focus on reducing demand, on changing the social settings that produce drug users, and on ending the social and economic marginality that induces individuals to enter the marketplace as users and sellers. 4. Every research project leaves some stones unturned. What stone from Smack are you most curious to see turned over soon? I used comic books and popular fiction from the 1950s to analyze the distance between the fictional heroin user, usually a white, middle-class adolescent, and the one found on the streets. I would have liked to have done more with fiction and with film—the National Archives has a host of ‘drug movies’—and for other periods than just the immediate postwar era, but I thought this would take me too far from the urban/social themes of the book. 5. BONUS QUESTION: In a Ken Burns film version of this book, who should provide the narration?